Two families, generations apart, are forever changed by a heartbreaking injustice in this poignant novel, inspired by a true story, for readers of Orphan Train and The Nightingale. Memphis, 1939. Twelve-year-old Rill Foss and her four younger siblings live a magical life aboard their family’s Mississippi River shantyboat. But when their father must rush their mother to the hospital one stormy night, Rill is left in charge—until strangers arrive in force. Wrenched from all that is familiar and thrown into a Tennessee Children’s Home Society orphanage, the Foss children are assured that they will soon be returned to their parents—but they quickly realize that the truth is much darker. At the mercy of the facility’s cruel director, Rill fights to keep her sisters and brother together—in a world of danger and uncertainty. Aiken, South Carolina, present day. Born into wealth and privilege, Avery Stafford seems to have it all: a successful career as a federal prosecutor, a handsome fiancé, and a lavish wedding on the horizon. But when Avery returns home to help her father weather a health crisis, a chance encounter leaves her with uncomfortable questions—and compels her to take a journey through her family's long-hidden history, on a path that will ultimately lead either to devastation or redemption. Based on one of America’s most notorious real-life scandals—in which Georgia Tann, director of a Memphis-based adoption organization, kidnapped and sold poor children to wealthy families all over the country—Wingate’s riveting, wrenching, and ultimately uplifting tale reminds us how, even though the paths we take can lead to many places, the heart never forgets where we belong. I had seen this novel mentioned pretty much everywhere I looked and so I put it on my wish-list. The local book club then chose this as their group read so I put it on hold and waited patiently for the person who was keeping the book past the due date to actually return it. I then read it in a single day and returned it the next day so that others could enjoy the story. The story is not one that will get you all happy warm/giddy as it actually is based on true events that ruined lives in the thirties and forties. We may never know the true ramifications of all that occurred with child trafficking. The summary above is long and accurate and I do not want to repeat it but I will say that I am ashamed how politics and big money used children as poorly as they have. The main characters in Wingate's telling may have been fictional but the overall theme of knowing that Georgia Tann actually did exist and did not have to do any time in prison is appalling to say the least. 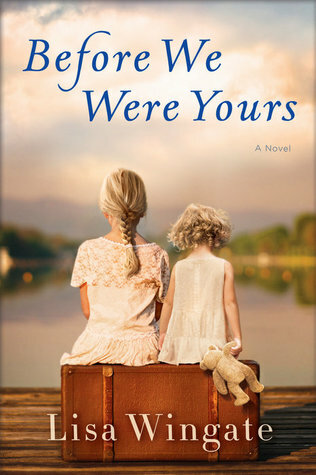 The Before We Were Yours story is woven with the present day story-line of a young woman following in the political footsteps of her father, and then the story of five young siblings stolen from their home and then are left to the fate of the evil Georgia Tann who sold kids under the guise of the orphanage Tennessee Children's Home Society. In real life we can only estimate the number of kidnap victims there were but there is today a memorial for the at least nineteen children known to have died in her care. It has been said that Georgia plucked children from poor families and gave them to the rich, such as Joan Crawford who paid $5,000 for one of her several adopted children. Blonde hair and blue eyes were the favored traits of the day. The life of living on river, a shanty-town family is vividly re-imagined in the novel and the main narrative of Rill Foss is so evocative and horrifically mesmerizing that I had to forsake all other duties so that I could read her story in full as I prayed for a happy ending after all she'd gone through. The redemption is finally (fictionally) found as the author brings about healing through the remaining family members years after their 'adoptions'. I was unsure of the connecting threads so it did keep me guessing as to who was who in their later years and how they related to the present day narrative. I absolutely love dual time-frame stories and this one is next on my favorites reads list. Definitely understand why this book was chosen as a 2017 Goodreads Choice for Historical Fiction as well as it being a bestseller, etc. I turned off commenting long ago on the blog but I welcome comments at the Facebook page here.